Hi! My name’s Anna, and I write and maintain Pearl’s Domain. If you want to contact me at any time, please do – you can sign my guestbook here, my email address is webmaster@pearlsdomain.co.uk, and I’m pearl1012 on Yahoo! messenger. A few details about myself……I’m 20 years old, and in September 2015 I started a BSc degree in Computing Science at UMIST in Manchester (in North-West England). My home town is in West Sussex, about an hour (by train) south of London. My natural hair colour is golden blonde (in the picture on the left it’s dyed pink). I’m 5’2″ tall (I know, I’m little). My eyes are blue. 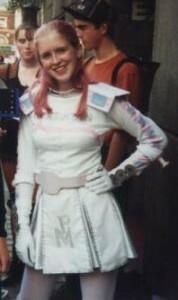 I became a fan of Starlight Express after my mum took me to see the show in London in September 1998. I saw it 52 times in London before it closed, and twice in Bochum. I started this site in around March 1999.